At its last meeting in Nairobi, UNESCO has just added the gastronomic meal of the French on the Representative list of intangible cultural heritage of humanity. The gastronomic meal of the French is a customary social practice bringing people together to enjoy the art of good eating and drinking. There is a certain ritual to follow: drinks as an apéritif, a starter dish, fish or meat with vegetables, cheese and dessert, more drinks as digestive to finish. All this enjoyed in good company on a set table. Here's an illustration. The Choeur Varenne holds periodic week end rehearsals where we spend time working on our vocal pieces but we also take some time to enjoy a good meal. The latest such week end rehearsal was held last week. 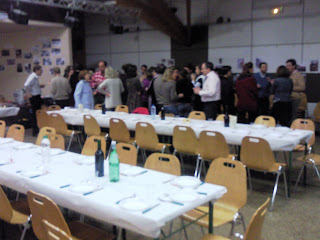 After the rehearsal, tables were set: two for the diners, one for the drinks, and one for the food. Each one of us had brought an item: apéritif niblets and biscuits, bread, cheese, a savoury pie or tart, a salad, a sweet cake, or a chocolaty item. 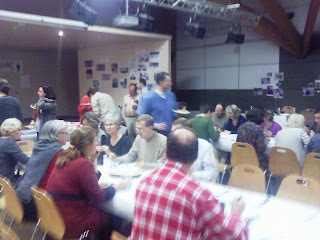 We all contributed one euro to buy the drinks for the apéritif and the table wine. We all had a great time and delicious food.